The Ruakiwi Reservoir, an iconic tower standing tall above the Hamilton Lake was in dire need of an upgrade and relocation to the Electrical and Automation Systems that had outgrown the original Pump House in which the equipment was located. The Pump House, complete with Motors, Pumps, Large Bore Pipes, Actuators and Sensors was difficult to navigate through, let alone undertake maintenance or additions. One Electrical were engaged by Hamilton City Council to assist in design, supply and install new Motor Control Centre and Distribution, which has Automatic Source Changeover to Genset capability, Uninterruptable Power Supply, PLC, 2 Custom built Network Cabinets, Variable Speed Drives and associated components for the reservoir. A new dedicated building, adjacent to the Pump House was constructed for this equipment. As the existing documentation was outdated and inaccurate, we started with a full set of CAD Electrical Drawings and I/O allocation for approval by our customer. On approval, we created a revised set of construction drawings to build from. Cabling to Pumps, Actuators, Sensors, Analysers and Instruments will be replaced, all of which will now be clearly labelled with its unique identifying TAG. New cable systems will be installed into the existing Pump House with appropriate segregation and installation methods to industry standard. While the transition from existing to new takes place, the reservoir will operate at normal capacity. We achieve this by liaising with the Hamilton City Waters Team to execute critical plant changeovers during pre-planned short-term shuts. We are delighted to be associated with this project, upgrading and installing Electrical and Control Systems to such a critical component of Hamilton’s infrastructure. 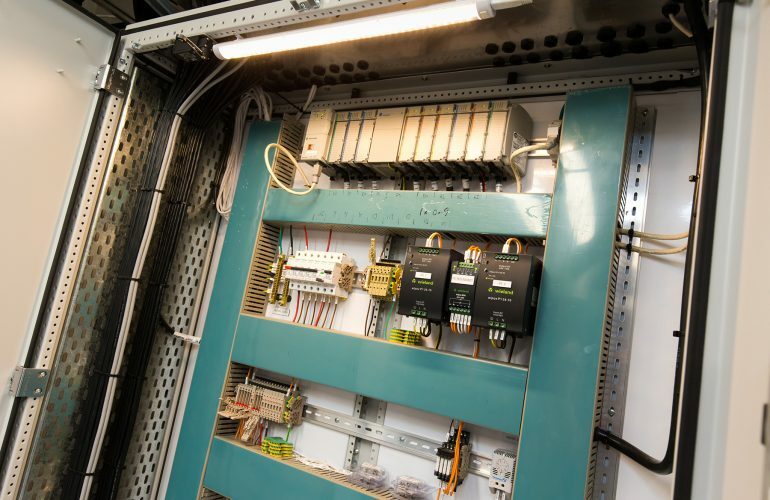 One Electrical are confident that the finished installation will provide an environment where break-downs, maintenance and capital works can be completed in a safe and timely manner.